A tool designed to help FPGA designers to manage and share their HDL code by automatically finding file dependencies, writing synthesis & simulation Makefiles, and fetching IP-Core libraries from remote repositories. If you are seeking for consultancy and training services on advanced hdlmake use cases, you can get commercial support from GL Research, the company on charge of maintaining and developing the tool. CERN, the European Organization for Nuclear Research, is the first and sole owner of all copyright of both this document and the associated source code deliverables. hdlmake is supported in both 32 and 64 bits operating systems. From version 3.0 onwards, hdlmake supports native Windows shells too, so you don’t need to cheat the system by using Cygwin like environments. hdlmake is a Python application and is distributed as an easy to build and deploy source code Python package. In order to run hdlmake as a shell command, the next process has to be followed. git: you need git for both fetching the hdlmake code and accessing to remote HDL repositories. svn: svn will only be used when accessing to remote SVN HDL repositories. In order to support Python 2.7.x and 3.x with a single codebase, the six Python package is now required to run hdlmake 3.0 version. There are two methods to obtain and install hdlmake: via git repository or PyPI. PyPI is the preferred method if you are only interested in releases. Git may be preferred if you are a developer, or would like to stay in sync with active development. Installing hdlmake via PyPI is straightforward assuming that you have pip already installed in your local Python environment. For directions on installing pip see the pip documentation. At this point, hdlmake is now installed into your active Python environment and can be run simply by executing hdlmake in your shell. hdlmake is now installed into your active Python environment and can be run simply by executing hdlmake in your shell. Alternatively, you may choose to forgo installing anything in your Python environment and simply directly run from the source by creating a launch script. Create a launch script in /usr/bin or any other available location at shell $PATH. You can name the script as you prefer so, by doing this, multiple hdlmake versions can easily be used in the same machine. In any case, in this documentation we will consider that the name for this launch script is just hdlmake. python2.7 is the executable of the Python deployment we want to use with hdlmake. path_to_hdlmake_sources is the absolute path in which the hdlmake source code has been fetched. hdl-make is the name of the folder created when you checked out the repo. hdlmake is the actual hdlmake package (this is not binary or a file, this is folder name). From the new 3.0 version onwards, hdlmake supports execution on native Windows shell, including both the old cmd and the new PowerShell. In this section, you’ll find instructions on how to install and configure the tool and the required versions of the programs (Git and Make). Install Git-scm for Windows. If the bin dir is not added to the PATH, you’ll need it to update the system environmental variable. Before running hdlmake 3.0, you’ll need to instal six package to work with Hdlmake (six is required to support Python 2.7 and 3.x with a single code base). As a companion of hdlmake, we can find a folder containing some easy design examples that can serve us as both tests and design templates. This folder is named hdl-make/tests/``and is automatically downloaded when the ``hdlmake git repository is fetched. modules contains the code of the design, a very simple 8-bit counter. sim contain a set of top manifests targeted to simulation by using different tools. syn contain a set of top manifests targeted to synthesis by using different tools. testbench contains a testbench for the design, covering the 8-bit counter. top contains a top module wrapper attaching the counter design to the pushbuttons & LEDs of a real FPGA design. 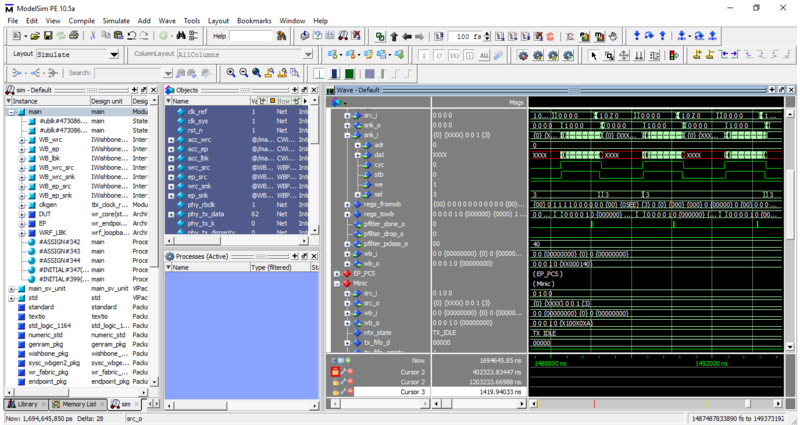 For each simulation or synthesis that can be executed, we have both Verilog and VHDL source codes for the module, testbench and top. So in every of the previous folder, we will have as children a verilog and an vhdl folder (note that ghdl only supports VHDL and iverilog only supports Verilog). If we take a deeper look to the modules folder we find that we really have two different hdlmake modules, one describing the counter as Verilog and other as VHDL. Now, if we focus on the testbench folder, we have that we have again two modules, targeted to cover both the VHDL and the Verilog based counter modules we have just seen. Note that, in both cases, the children modules are local. We can see that there is a top Manifest.py for both Verilog and VHDL languages. In addition, we have a vsim.do file that contains Modelsim specific commands that are common for both HDL languages. sim_post_cmd = "vsim -do ../vsim.do -i counter_tb"
In both cases, we can see that the modules parameter points to the specific VHDL or Verilog testbench, while the other fields remain the same for both of the languages. action: indicates that we are going to perform a simulation. sim_tool: indicates that modelsim is going to be the simulation we are going to use. sim_top: indicates the name of the top HDL entity/instance that is going to be simulated. sim_post_cmd: indicates a command that must be issued after the simulation process has finnished. If everything goes well, a graphical viewer should appear showing the simulated waveform. Note that every simulation top Manifest.py in the sim folder includes a tool specific sim_post_command, so all the simulations in this example can be generated by using the same simple command sequence that has been exposed here. The top folder contains the a series of HDL files describing how to attach the counter design to the PushButtons & LEDs of real FPGA powered design. The set has been chosed so that we have an example of every FPGA vendor supported by the hdlmake tool. We can see that we have two different modules, one for VHDL and one for Verilog, each one containing a top module that links the counter design module to the outer world. In addition, we have a common spec_top.ucf constraints file that defines the specific FPGA pins that are connected with each HDL design port. Once we have a constrained design targeted to a real FPGA board, we can generate a valid bitstream configuration file that can be downloaded into the FPGA configuration memory. In order to do that, we can use hdlmake to generate a synthesis Makefile that is able to perform the complete process by running a step-by-step flow that starts with the project generation and ends with the bitstream compiling. The main advantage of this approach is that, when synthesizing complex designs, the process can be resumed if it fails or is halted and the already performed jobs don’t need to be re-launched again. project: Create the synthesis tool specific project. synthesize: Synthesize the HDL source code. translate: Translate to synthesis tool format. map: Map the translated design into FPGA building blocks. par: Execute Place & Route for the selected FPGA device. bitstream: Generate the bitstream for FPGA programming. For each of the potential synthesis targets, a Tool Command Language (TCL) file will be created as a dependency in the Makefile. These TCL files include the tool specific commands that are then sourced to the selected tool to perform the different synthesis stages. We have chosen to use TCL files as the intermediate format as this is the de-facto standard language that has been selected by the FPGA vendors. A TCL file associated to a specific synthesis stage can be generated without sourcing it to the tool by just calling Make with the associated target name (project.tcl, synthesize.tcl, translate.tcl, map.tcl, par.tcl, bitstream.tcl). In this way, this files can be integrated into other custom development flows. note that we have an additional files.tcl target. This is a dependency target for the project, and includes the TCL commands that are required all of the different design files to the tool in an appropriated way. Note that we have a different tool associated to each of the different supported vendor specific FPGA boards. The only exception is the spec_v4 design, that can be synthesized by using both Xilinx ISE and Xilinx PlanAhead. syn_top: indicates the name of the top HDL instance/module to be synthesized. syn_project: indicates the name of the FPGA project that is going to be created. syn_tool: indicates the specific synthesis tool that is going to be used. So, once hdlmake has already generated the Makefile, issuing a simple make command is enough to synthesize a valid bitstream. Then, we can issue a clean target for make in order to erase the most of the intermediate generated stuff and even a mrproper one to remove everything included the generated bitstreams. Note that hdlmake and the examples included in the counter test have been designed in order to be regular across the different toolchains. In this way, every top Manifest.py for synthesis in the syn folder can be executed to build a valid bitstream by using the same command sequence we have seen in this section. Let’s take a simple example of how hdlmake handles repositories. We only have the local key and an asociated five elements list containing the path to the respective local folders where the modules are stored. Now we can see that the local key just has an associated path (i.e. this is a 1-element list), while we have two additional key identifiers: svn, pointing to a list of two remote SVN repositories, and git, pointing to a single remote GIT repository. Regarding the SVN repositories, module2 is pointing to the default/head revision while module3 SVN repository is pointing to revision number 25 by appending the @25 sufix to the repository URL..
# e.g. : target branch is "develop"
# e.g. : target tag is "v1.0"
# e.g. : target commit is "a964df3d84f84ef1f87acb300c4946d8c33e526a"
if the requested Git repository is declared as a git submodule too and we do not provide an extra :: or @@ modifier in the Manifest.py, hdlmake will read the desired commit id from the respective submodule declaration and will checkout this code revision right after the repository is cloned. Finally, the GITSM is just a standard Git repository and operates in the same way. The only difference with a standard Git repository for hdlmake consists in that once a GITSM module has been cloned, a recursive git submodule init and git submodule update process will be launched for this repository. Now, if we run the hdlmake fetch command from inside the folder where the top Manifest.py is stored, hdlmake will read the local, SVN and GIT module lists and will automatically clone/fetch the remote SVN and GIT repositories. The only issue is that the modules would be fetched to the directory in which we are placed, which is not very elegant. To make the process more flexible, we can add the fetchto option to the manifest in order to point to the actual folder in which we want to store our remotely hosted modules. As we have already seen in the simulation example, hdlmake allows for the injection of optional external shell commands that are executed just before and/or just after the selected action has been executed. By using this feature, we can automate other custom tasks in addition to the hdlmake specific ones. If a external command has been defined in the top Manifest, this is automatically written by hdlmake into the generated Makefile. In this way, the external commands are automatically executed in order when a make command is issued. syn_pre_<stage>_cmd: this command is executed before executing the <stage> synthesis step. syn_post_<stage>_cmd: this command is executed after executing the <stage> synthesis step. syn_pre_project_cmd = "echo hello world!" syn_post_bitstream_cmd = "echo bye, bye world!" sim_pre_cmd = "echo This is executed just before the simulation"
sim_post_cmd = "echo This is executed just after the simulation"
If you need to execute a more complex action from the pre/post synthesis/simulation commands, you can point to an external shell script or program. As an alternative, you can use a multiline string in order to inject multiple commands into the Makefile. In order to give an extra level of flexibility when defining the files and modules that are going to be used in a specific project, hdlmake allows for the introduction of custom Python variables and code in the Manifest.py hierarchy. This is a very handy feature when different synthesis or simulation configurations in complex designs should be selected from the top level Manifest when running hdlmake. As a very simple example of how this mechanism can be used, suppose that we want to simulate a design that uses a module for which two different harware descriptions are available, one in VHDL and one in Verilog (mixed language is a common feature of commercial simulation tools and is an under-development feature for Icarus Verilog). As a non-trivial design example of a real use case of hdlmake with Xilinx ISE, we have chosen the White Rabbit PTP Core reference design the European Organization for Nuclear Research (CERN) provides for the Simple PCIe FMC Carrier (SPEC). This open-hardware platform is powered by a Xilinx Spartan-6 and is used in multiple experimental physics facilities around the world. In the following instructions, we will see how easy is to build the bitstream from the command line (tested on both Windows and Linux hosts). Alternatively, if you only want to download the design submodule dependencies the design needs, we can use the hdlmake fetch feature as the required remote modules are already listed in the provided Manifest.py. As the Git remote modules directives doesn’t point to a specific branch or commit id, hdlmake will only clone the listed repositories in the fetchto folder and then will checkout the appropriated commits by previously interrogating the git submodule mechanism. If you experience any problem, please perform a make clean before running Make. The synthesis should run fine after doing this – the design comes out of the box with an Xilinx *.ise project created with hdlmake 2.1, while in hdlmake 3.0 the synthesis project file is created by the Makefile. As an advanced example for Xilinx Vivado, we have chosen the Beam Position Monitor (BPM) design from the Beam Diagnostics group of the Brazilian Synchrotron Light Laboratory (LNLS) for the AMC FMC Carrier (AFC). Equiped in Xilinx Artix-7 FPGA, it allows to connect clock source to any clock input. In order to allow the use of IP-XACT IP Core libraries for Vivado, the fetcho variable in the Manifest.py hierarchy is not only used as the folder to store remote hdlmake modules, but it’s automatically assigned as the value for the ip_repo_paths Vivado project property. If you are generating HDL code from a Xilinx IP library, you may need to select the target language by setting the language top manifest variable to either vhdl or verilog. If the language variable is not defined, hdlmake will choose vhdl as the default HDL language. In the same source code design the CERN provides for the White Rabbit PTP Core, it is also included an example for the VME FMC Carrier HPC-DDR3 (VFC-HD). The VFC-HD is an Intel Arria V based VME64x carrier for one High Pin Count (HPC) FPGA Mezzanine Card (FMC, VITA 57). It is has six SFP+ transceivers compatible with support for rad-hard GBT links, CERN Beam Synchronous Timing (BST), White Rabbit and Ethernet. It’s important to know that this design relies on versioned Intel IP-Cores, so it will only work just out of the box with the appropriated Intel Quartus version (WR PTP Core v4.0 requires Intel Quartus 16.0). When working with Verilog and SystemVerilog included files in Modelsim and derivatives, you will need to use the include_dirs parameter in Manifest.py to specify the directories in which the files to be included can be stored. It’s important to know that the +incdir+ directives will automatically be stripped from vlog_opt by hdlmake. By using the -f FILENAME, --filename FILENAME optional argument for the makefile command, we can choose the name of the synthesis or simulation Makefile that will be generated by hdlmake. in any case, it’s supposed that all the required modules have been previously fetched. Otherwise, the process will fail. Fetch and/or update remote modules listed in Manifest. It is assumed that a projects can consist of modules, that are stored in different places (locally or a repo). The same thing is about each of those modules - they can be based on other modules. Hdlmake can fetch all of them and store them in specified places. For each module one can specify a target catalog with manifest variable fetchto. Its value must be a name (existent or not) of a folder. The folder may be located anywhere in the filesystem. It must be then a relative path (hdlmake support solely relative paths). List all the modules involved in the design described by the top manifest and its children hierarchy. The output list will be printed in stdout, being each of the modules represented by a single text line made up of two entries separated by a tab. The first entry in a line associated to a module is the relative path to the specific directory where the module is stored, while the second entry is a identifier indicating the origin of the module. the hierarchy will be built considering that the Manifest.py stored in the folder from which we all launching the command is the root one. If we provide the --with-files argument to list-mods, the files being directly included by a specific module will be printed just after the line pointing to this specific module. Each of the printed lines associated to a file will be composed by two entries too, the first one pointing to the relative path to the file and the second one indicating that the resource is a file. In addition to the lines representing modules and files, list-mods will also print to standard output some comments providing additional information about the structure of the module hierarchy. This modules will start with a # sign, following in this way the usual shell convention. By providing the --terse argument to list-mods, the comment lines won’t be printed to stdout, being only printed those lines representing an actual resource (module or file). List all the files that are defined inside all of the modules included in the hierachy in the form of a string of elements separated by a DELIMITER and print this list to stdout. The DELIMITER is defaulted to a white space, but it can be defined by using the --delimiter DELIMITER argument for the list-files command. the file list will be built considering that the Manifest.py stored in the folder from which we are launching the command is the root one. In order to build the file list, hdlmake will parse the HDL files to find the required dependencies that a top entity needs to be successfuly compiled. We can configure the name of the HDL module that will be considered as the top entity to build the required file hierarchy by using the --top TOP optional argument to the list-files command. If no top entity is defined, all of the design files will be listed. Finally, by using the --reverse optional argument we are able to reverse the order of the listed files. Hdlmake can be run with several arguments. The way of using them is identical with the standard one in Linux systems. The order of the arguments is not important. Hereafter you can find each argument with a short description. Shows help message that is automatically generated with Python’s optparse module. Gives a short description of each available option. Print the version of the hdlmake instance on execution an quit. Disable the stage in which hdlmake purges the files that are considered as not dependent on the top entity. In this way, by activating this flag all of the files listed by the module hierarchy will be used for the issued action. Add arbitrary Python code from the command line that will be evaluated before each Manifest.py parse action across the hierarchy. Add arbitrary Python code from the command line that will be evaluated after each Manifest.py parse action across the hierarchy. © Copyright 2013-2015, CERN. Created using Sphinx 1.8.5.